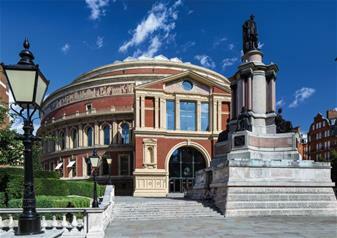 Built in memorial to Queen Victoria’s husband Prince Albert and standing proudly opposite the beautiful Kensington Gardens, The Royal Albert Hall is one of the most iconic venues in the world. Enjoy the Grand Tour and get a unique insight into the rich history, gorgeous architecture and inner workings of this stunning building and enjoy a sumptuous afternoon tea in the Hall’s Verdi restaurant. Led by a knowledgeable and friendly guide, the tour covers the amazing history of the building, right back to when it was opened by Queen Victoria herself in 1871. See the glorious auditorium and take in the breathtaking views from the gallery. Enjoy exclusive access to the Royal Retiring Room and perhaps even see some of the artists rehearsing for the evening’s performance! The perfect accompaniment to the Grand Tour, tuck in to a delicious afternoon tea in the Hall’s Verdi restaurant, overlooking the Royal College of Music. Enjoy delicate finger sandwiches, scones with clotted cream and jam, sweet cakes and a pot of East India Company tea.